Also for canoes and very small boats. The Torqeedo Ultralight's on-board computer calculates the remaining range constantly, by linking the motor's consumption data with the charging level of the batteries, and the speed over the ground from the GPS. This allows you to read the remaining range in real time from the motor display or the smartphone app TorqTrac. Learn about the benefits of our lightest motor, the Ultralight 403, for yourself. What power does the integrated battery deliver? The battery has a capacity of 320 Wh, i.e. 11 Ah at 29.6 V.
When the battery is completely discharged it takes approx. 12 hours to fully recharge it. A full recharge using the fast charger (not included) only takes approx. 4 hours. With the solar charger 45 W (accessory) you can charge anytime, during travel and while the sun is out. What useful life can I expect the lithium batteries to have? The life expectancy of lithium batteries in recreational use is, more or less, independent of charging cycles. There is no memory effect either, i.e. you can fully charge them after each trip irrespective of the charge status shown in the display. Generally speaking, a capacity loss of approx. 4 % per year is to be expected. Capacity loss will, however, accelerate if the battery is permanently exposed to heat. Also storing the battery always fully charged will accelerate ageing. There are no concerns about using the battery in high temperatures, we recommend that you take the battery out of the sun and store it in a cool place after use. Your battery must be returned to a Torqeedo Service Centre for service 8 years after the date of manufacture. Can the Ultralight 403 be connected to the steering? 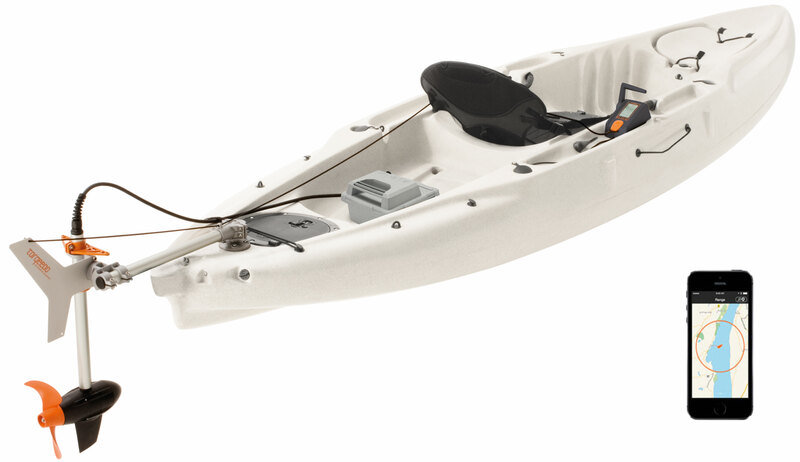 Yes, the Ultralight 403 can be connected to your kayak's steering system. Please refer to your kayak's instructions and our information on mounting. What happens if I capsize? If the kayak capsizes, the motor stops automatically to prevent injury – provided the magnetic kill switch is attached to your wrist or life jacket. The motor only runs when the magnetic kill switch is placed in the prescribed position on the remote throttle. Should you fall overboard, the magnetic kill switch will go with you and the motor will stop immediately. What is the warranty on the Ultralight 403? The Ultralight 403 has a 2-year warranty from the date of purchase for non-commercial use. Use with Hobie kayaks: We recommend the Hobie "evolve" product (available from Hobie dealers). Use with Grabner kayaks: Please use the Grabner mounting kit. Use with Prijon kayaks: Please use the Prijon rudder mounting. All others: The ultralight 403 can be mounted on just about any kayak using the mounting ball provided.